Bovo-Tighe partners with many companies in the energy business. For years, part of that work has taken us to Alaska’s North Slope to work with these partners and their supporting organizations to run engagement activities that have had a significant positive impact on productivity in a challenging environment. The return-on-investment for our partners has consistently exceeded 500% by focusing on creating a cultural mindset that emphasizes collaboration, mutual benefit and valuing each individual contribution to the whole enterprise. Happy Thanksgiving from Everyone at Bovo-Tighe! November Productivity Makes Holidays Happier! 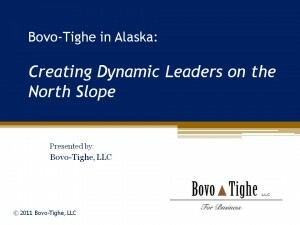 The link to Bovo-Tighe's December 2010 Client Newsletter. Stop limiting your people: Bump team productivity 50% by eliminating bad corporate habits and mindsets. New time management techniques, from the world of sports? Yes! What drives employees away? It’s not just a bad boss (although that helps)!